The Black Bears Softball team runs its winning streak to 9 games by winning 2 games on Tuesday. The Black Bears beat Penn in the opener 6 - 4 and Bryant 10 - 4 in the afternoon game. The Portland Pirates missed a chance to gain some playoff ground, losing to the Binghamton Senators 3 -1 on a rare Tuesday night tilt. In World Baseball Classic news, The Netherlands beat the Dominican Republic 2 - 1 in 11 innings Tuesday. 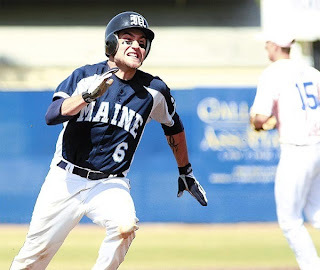 Former Maine Black Black Bear Curt Smith moved the tying run to third and Eugene Kingsale atoned for his error in the top of the 11th by singling in the trying run and scoring the winning run. The Boston Bruins offense takes leave yet again, losing to the Columbus Blue Jackets 2 - 0 in Columbus. Mike Lowell got back into the swing of things for the Sox yesterday with no problems reported. Clay Buchholz has a good couple of innings in the 5 - 1 loss to Baltimore. The New England Patriots secondary is going to look very different in 2009 as they signed Leigh Bodden to a contract on Tuesday.